Among the many posts and articles on the canonization of St. John Paul II last year, there were few comments about his efforts to effect a rapprochement between the Church and science (notice the upper case and lack thereof). The term “rapprochement” has been chosen with care: “an establishment or resumption of harmonious relations” (Oxford English Dictionary). The term is applied to peace treaties after a state of war, and although the Catholic Church has not declared war on science, there are those scientists who do think there is such a war, and there are those advocates of scientism–that science explains all we need to know about the world–who have declared war on the Church. These last ignore the founding contribution of the Church to the establishment of science (see Stacy Trasanco’s Science was born of Christianity , and the contribution of Catholic Religious (Mendel, LeMaitre amongst many) to science in Fathers of Science. There are three ways in which St. JP II tried to bring about this rapprochement: 1) redressing the Galileo Affair; 2) making the position of the Church on evolution clear and consistent with both dogma and science; 3) instituting conferences on how Divine Intervention might be manifested in several scientific disciplines. The first two have been dealt with at some length in the blogosphere, so I’ll treat those only briefly. I’ll focus on the third, which has been an invaluable resource for me in my discussions of science and religion. Summarizing his arguments, one can say that both Galileo and some Church officials were at fault, but it was a different time with different concerns. High officials in the Church, initially sympathetic to Galileo, were defending orthodoxy against the onslaught of the Reformation. Galileo was condemned not for his advocacy of the Copernican theory, per se, but for his advocacy that Scripture was to be interpreted loosely (even though the same had been done by St. Augustine). And his science was wrong–circular orbits for the planets and his theory of tides. All this is dealt with at greater length in the article linked above. He also showed much insight in commenting on the scientific aspects of evolution, that while evolution (the descent of species) is a fact, there is more than one theory–mechanism–proposed to explain evolution. It is unfortunate that both scientists and lay persons do not share St. JP II’s understanding, but equate the Darwinian model for evolution–“survival of the fittest”–with evolution, the descent of species. And as with his apology for the Galileo affair, the liberal media made much of his acknowledgement that evolution is a fact, but neglected the historical and theological context which he brought to that statement. “The unity we perceive in creation on the basis of our faith in Jesus Christ as Lord of the universe…seems to be reflected and even reinforced in what contemporary science is revealing to us….Contemporary physics forms a striking example. The quest for unification of all four fundamental physical forces–gravitation, electromagnetism, the strong and weak nuclear interactions–has met with increasing success….In the life sciences, too, something similar has happened. 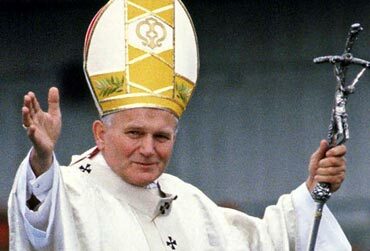 Molecular biologists have probed the structure of living material…(and) have discovered that the same underlying constituents (genes and proteins coded by genes) serve in the make-up of all living organisms on earth.” St. John Paul II, letter to George Coyne. “By encouraging openness between the Church and the scientific communities, we are not envisioning a disciplinary unity between theology and science like that which exists within a given scientific field or within theology proper….The Church does not propose that science should become religion or religion science…To be more specific, both religion and science must preserve their autonomy and their distinctiveness….Christianity possesses the source of its justification within itself and does not expect science to constitute its primary apologetic (emphasis added). Science must bear witness to its own worth….neither ought to assume that it forms a necessary premise for the other.” ibid. The quotation above reminds me of my encounters playing harmony parts (tenor and bass) in our Church instrumental group: the musical lines are distinct, for the most part different, but the harmony enriches the melody, as does science, theology. “For the truth of the matter is that the Church and the scientific community will inevitably interact….Christians will inevitably assimilate the prevailing ideas about the world, and these are inevitably shaped by science. The only question is whether they will do this critically or unreflectively, with depth and nuance or with a shallowness that debases the Gospel and leaves us ashamed before history. Scientists, like all human beings, will make decisions on what gives value and meaning to their lives and to their work. This they will do well or poorly, with the reflective depth that theological wisdom can help them attain, or with an unconsidered absolutizing of their results beyond their reasonable and proper limits.” ibid. The last sentence in the above quote applies very well, I believe, to those cosmologists such as Stephen Hawking and cognitive scientists such as Stephen Pinker, who deny God on the basis of a limitless science. I’ll have to add that all the insights above (with the possible exception of the musical analogy) are those of St. John Paul II. I’ve been blessed in being able to bring these to the attention of others. Finally, as a postscript, here is a list of these conferences and links to the proceedings published by the Vatican Observatory and University of Notre Dame Press. On the web page of the Center for Natural Sciences and Theology that lists the books, you will see images of each book. If you click on the book image, there will appear article headings at the right of the web-page, which will link to the article of interest. Physics, Philosophy and Theology–A Quest for Common Understanding. Quantum Cosmology and the Laws of Nature–Scientific Perspectives on Divine Action. Chaos and Complexity–Scientific Perspectives on Divine Action. Neuroscience and the Person–Scientific Perspectives on Divine Action. Evolutionary and Molecular Biology–Scientific Perspectives on Divine Action. Quantum Mechanics–Scientific Perspectives on Divine Action.